Dramatic footage has emerged of the moment a truck sped down Drottninggatan, Stockholm before plowing into a group of people, killing four and injuring 15 others. The short clip was caught on the CCTV of a store along the street and uploaded to the social media accounts of Swedish newspaper Expressen. People can be seen calmly walking down the street before panic sets in and people are seen running down the street and into the store. Moments later, the truck speeds past the store window. 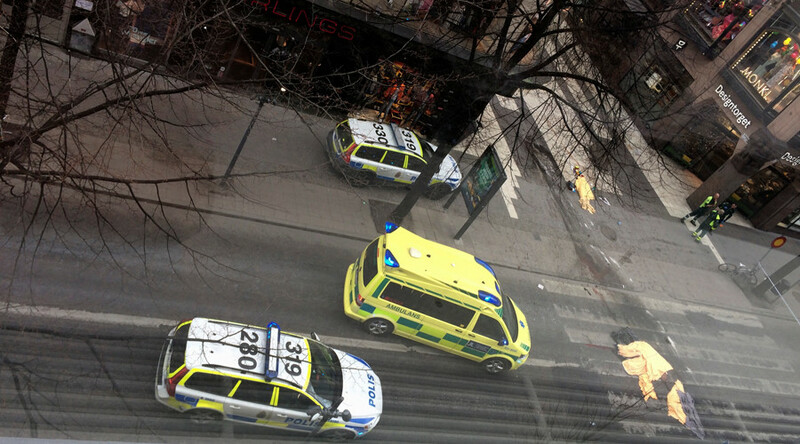 The truck continued down Drottninggatan before crashing into an Ahlens department store. Stockholm Police have confirmed that one person has been arrested and that they "have particular interest in him in regard to the ongoing investigation."